Q: I was updating my iPad to the latest operating system, but suddenly it was stuck in the recovery mode. I tried to restart my iPad by pressing the power button several times but nothing changed, and I also plugged it to my computer to see if it had som e reaction, but still the same situation. Now 5 hours have passed, I have no idea what to do with my iPad. How can I get it out of the recovery mode? I truly appreciate if you can help me solve this problem. As we know, getting out of recovery mode requires you to restore your iPad to factory defaults which means all your data will be gone. In order to get the data back, you are in need of a good recovery program. Here I strongly recommend this software for your reference - MobiKin Doctor for iOS (Windows 8/7) or MobiKin Doctor for iOS (Mac OS X). 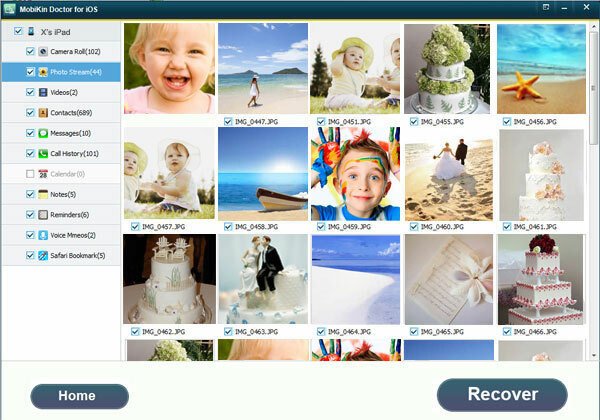 With the aid of this powerful software, you are able to rescue all lost data on your iPad without any limitation. If you are interested in this program, you can download a free trial version to have a try by yourself. Apart from the method to restore the data, we will also tell you how to get iPad out of recovery mode in details later in the next contents. How to Get iPad out of Recovery Mode after Update? Download and install the latest version of iTunes on the computer and launch it after the installation. Then connect your iPad to your computer via USB cable. Click to select the iPad from the list of devices on the left side of the iTunes window. Next, hit the "Summary" tab in the main iTunes interface, and click the "Restore" button when prompted. Then, select to either restore from a backup or to factory defaults. Now you can wait until iTunes finishes restoring your iPad. This process may take several minutes, so please be patient. When the restoration is done, the iPad restarts itself. At this moment, as your iPad is in original condition, all the data on it are wiped out. So you need the data recovery software to help you restore the files from iPad. How to Retrieve Lost Data from iPad on Windows Computer or Mac? 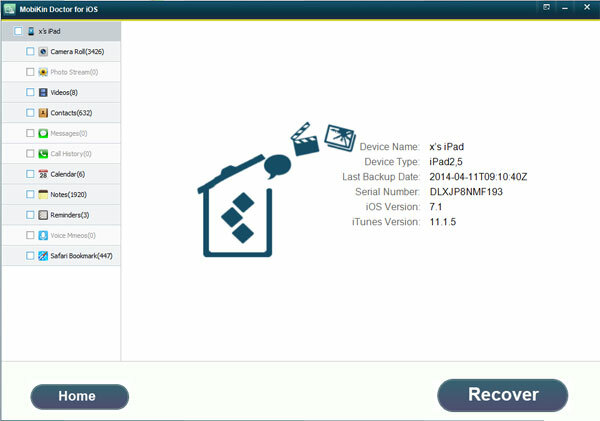 Download the data recovery software, and connect your iPad to the computer via USB cable. Launch the program. If your iPad is jailbreaked, then you can choose "Recover from iOS Device" directly. If not, you can follow the steps shown on the interface below and then click "StartScan". Here are the results after the scanning, you can view the information of your iPad on the window below. Preview the categories on the left column and choose the folders you want to restore. Then mark them and click "Recover" on the right bottom of the window. For example, click "Photo Stream " and you can see the pictures on the right side, then tick those you wish to get back and hit "Recover" to save them on your computer. 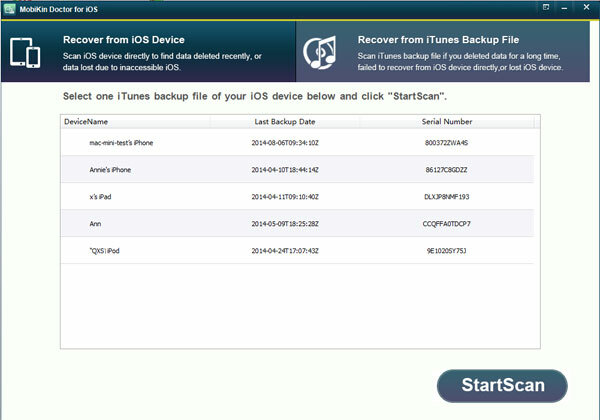 How to Recover Lost Data on iPad from iTunes Backup File? Make sure that you have the backup of your iPad data. Then you can start recovering the lost iPad data. 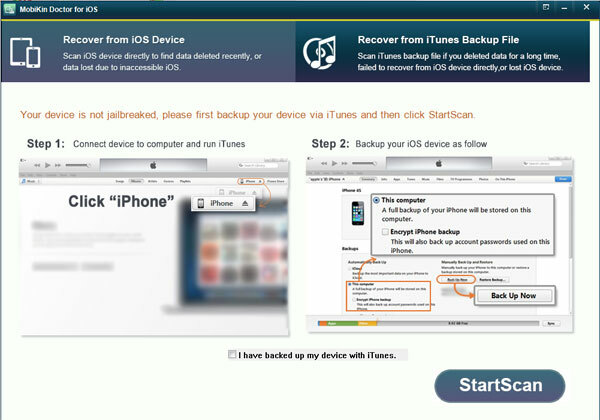 Click the mode "Recover from iTunes Backup File" and go on with the same steps taken in the first mode. Tips: If you haven't jailbreaked your iPad and don't intend to jailbreak it while you have backed up the data of iPad before, you'd better choose this mode because you don't have to connect your iPad to the computer which saves your time in some degree. Note: Compatible iOS devices: iPad Air/4/2, iPad Mini 3/2, iPhone 6 Plus/6/5S/5C/5/4S, iPod touch/shuffle/nano, etc.